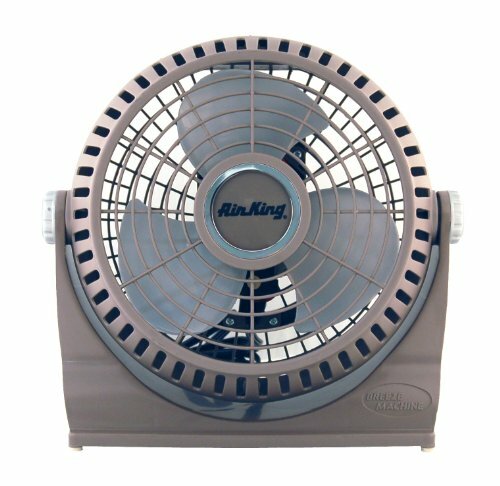 The Air King 9525 9-Inch 2-Speed Pivot Fan is ideal for use in offices, production lines, kitchens, beauty salons, toll booths, stores and anywhere else space is limited. The 9-inch, 3-blade fan is constructed of impact resistant plastic with chemical resistant polypropylene blades for long-lasting durability. The rotary switches located on the back allow you to turn the fan on or off and change between (2) speeds. The 1/100-horsepower, permanently lubricated motor moves 430-CFM on high and 340-CFM on low. The pivoting fan head allows you to direct the air flow exactly where it is needed most. Additionally, this fan is ETL and OSHA approved and a 6-foot, 3-conductor type SJT power cord is provided for long reach. The fan measure 13-inches long by 6-inches wide by 13-inches high and weighs 4.1-pounds. The Air King 9525 9-Inch 2-Speed Pivot Fan comes with a 1-year limited warranty. Air King offers a full line of industrial grade and commercial grade air circulating fan solutions to meet almost any need you might have. Whether your need is in industrial settings such as manufacturing plants and warehouses or more commercial setting such as offices, schools or hospitals - Air King has the perfect solution for you. Powerful motors that last for years and years are what Air King's Air Circulators have come to been know as and we are not stopping now. Visit www.amazon.com/airking for more information on Air King and our extensive line of products.